Arijit Singh Top 10 Songs October 2018. Latest Bollywood New Hindi Song with lyrics of hit movies and album soundtrack. He is a Multi talented Music programmer, Musician, Singer, Music Composer and Music Producer. His Voice is very beautiful and penetrates the soul. Pal Song is from the Bollywood Movie Jalebi. The Star cast of this new video song is Varun Mitra and Rhea Chakraborty. The Singers are Arijit Singh and Shreya Ghoshal. Lyrics are written by Prashant Ingole and Kunaal Vermaa. Javed – Mohsin is the Music Composer. Tera Fitoor Song is from the Hindi Film Genius 2018. It is starring Utkarsh Sharma and Ishita Chauhan. Arijit Singh is the Singer of this latest song. Kumaar is the Lyricist. The Music Director is Himesh Reshammiya. Bairaagi Song is from the Movie Bareilly Ki Barfi. It is featuring Kriti Sanon, Ayushmann Khurrana and Rajkumar Rao. The Singers are Arijit Singh and Samira Koppikar. Puneet Sharma has written the Lyrics of this song. The Music is composed by Samira Koppikar. Ik Vaari Aa Song is from the Bollywood Hindi Movie Raabta. The Star Cast of this video song is Sushant Singh Rajput and Kriti Sanon. Arijit Singh is the Singer. The Lyricist is Amitabh Bhattacharya. Pritam is the Music Director. Tu Hi Hai Song is starring Alia Bhatt and Shah Rukh Khan from the Movie Dear Zindagi. The Singer is Arijit Singh. The Music Composer is Amit Trivedi. Kausar Munir has written the lyrics of this romantic song. Lambiyaan Si Judaiyaan song is featuring Sushant Singh Rajput and Kriti Sanon from the Bollywood film Raabta. Arijit Singh has sung this song. The Lyrics are written by Amitabh Bhattacharya. JAM8 is the Music Composer of this Hindi video song. Mara Ishq Song is from the Bollywood Movie Saansein. The Star cast of this video song is Rajneesh Duggal and Sonarika Bhadoria. The Singers are Arijit Singh, Ash King, Swati Sharma, Dev Negi and Joy Baurah. Kumaar is the Lyricist. Vivek Kar is the Music Director. The Breakup song is from the Film Ae Dil Hai Mushkil. It is starring Ranbir Kapoor and Anushka Sharma. The Most talented singers are Arijit Singh, Badshah, Nakash Aziz and Jonita Gandhi. The Lyrics are written by Amitabh Bhattacharya. Pritam Chakraborty is the Music Composer. Binte Dil Song is from the Hindi Movie Padmaavat. It is featuring Ranveer Singh and Jim Sarbh. Arijit Sing is the Singer of this song. A M Turaz is the Lyricist. The Music Director is Sanjay Leela Bhansali. Har Har Gange Song is from the Bollywood movie Batti Gul Meter Chalu. The Star cast of this song is Shraddha Kapoor and Shahid Kapoor. The Most talented singer is Arjit Singh. Siddharth-Garima has written the Lyrics of the song. Sachet-Parampara is the Music composer. Our expert has created this list on the basis of response. 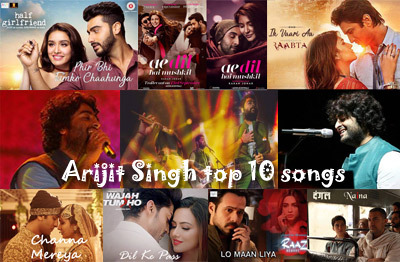 Kindly share your views to improve Arijit Singh Top 10 Songs list. We are trying to serve you better.